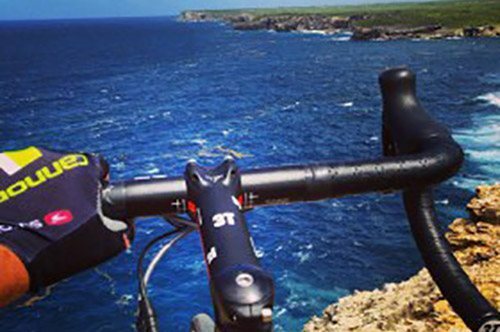 Do not hesitate anymore about exploring our islands on a bike! 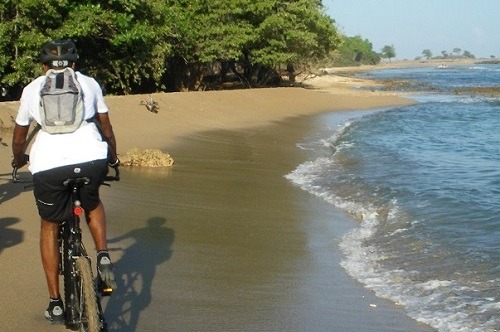 Call Discover France Adventure at 1-800-929-0152 and find out more about Guadeloupe Islands road cycling guided tours. Since our archipelago is a Department of France, infrastructure are modern and most importantly for a cyclist, this means you find small, well-paved farm roads connecting everything. The total area is over 600 square miles (1600+ square kilometers) with more than 600 miles of paved (1000+ kilometers) of catalogued national and county roads. Known as the “butterfly” island for it’s two distinct wing-shaped halves, Guadeloupe is divided by a marshy river known as the Rivière Salée. The Basse Terre half is mountainous, with fewer roads and more challenging terrain. It houses a still mildly active volcano, La Soufrière (4812FT/1467M), which is the highest point in the eastern Caribbean (Lesser Antilles to some). There’s a dead-end paved road up one side, with the latter part reaching high into the misty rain forest. Grades reach 20+ percent and, with mossy sections of concrete, can be practically unridable – just in case you needed a challenge. Non-volcanic, the Grande Terre side has more roads, and centers around the seriously rolling forested hills of the Grands Fonds. Reaching to the north and east are the flatter plains, covered by bright green fields of cane. 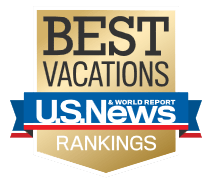 And you can trace much of the perimeter on breezy coastal stretches, with spectacular views over the Atlantic and Caribbean waters. 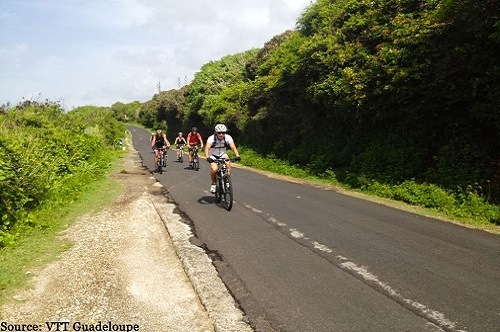 The wide variety of outdoor and other activities make Guadeloupe Islands an ideal destination for cyclists to bring family and friends. Most importantly cycling is the #1 Sport! So get ready to feel like a star on our roads!! Cheers and shouts of encouragement are guaranteed! We are like that in the Guadeloupe Islands! 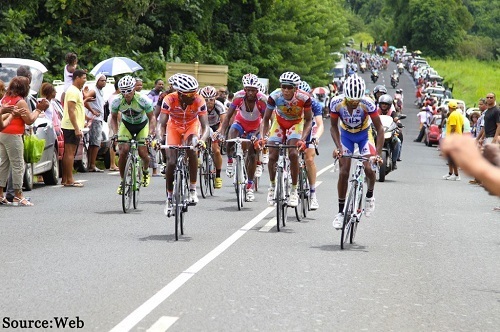 With 41 editions, the cycling race around Marie-Galante is a major sport event. The Marie Galante race lasts 5 days. All the different teams of the 5 islands of Guadeloupe want the beat the champion’s record and there are about fifteen teams engaged in this race around « La Grande Galette ». A Festive atmosphere and mind-blowing landscapes make this race, the most loved cycling race in Guadeloupe after the International “Tour de la Guadeloupe” race! National Natural Reserve, La Desirade Island is heavy with landscapes to discover by bike. The tour of the island (it is actually one main road along the cost line) is between 25 and 30 km long, you should count around two to three hours to do it entirely. This bike ride is not for beginners since temperatures are very hot but it’s well worth it! The Views are just breathtaking. 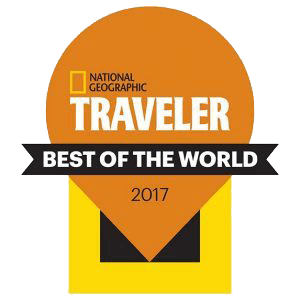 Visit the beaches of Grande terre differently. Start your ride from Datcha beach in Gosier and continue on to Ste-Anne via the main route, stop at La Caravelle beach and then refresh in the Center Ste-Anne. During your ramble , you will discover small coves as pretty as one another. In Le Moule, ride through sugar cane fields and stop by the Damoiseau Distilleries and a local restaurant for lunch to recharge your batteries before losing yourself in Les Grands-Fonds in Gosier. Finish this amazing ride on St-Felix beach ! From inside the rainforest to sugar cane fields our biking trails are ready for you!, Ford crossings and technical passages are reserved for more seasoned bikers, while many mountain bike paths are suitable to all levels in Grande-Terre, Marie-Galante and La Désirade. 9 days, 1256 km .The Tour de la Guadeloupe includes 9 stop-offs and is by far the the most popular event as the entire population joins in ! 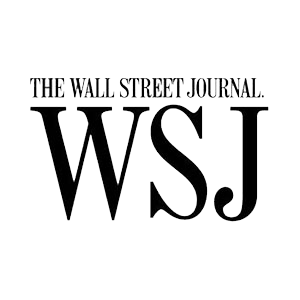 It is also the oldest one with 64 editions. Delve into a UNIQUE atmosphere ! From 7 to 77 everybody celebrates the #1 sport in Guadeloupe !! 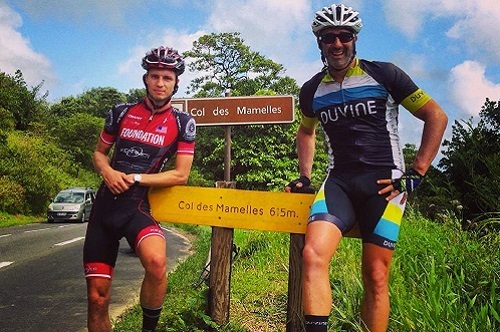 More than a sport event, « Le Tour Cycliste de la Guadeloupe » is a cultural event.